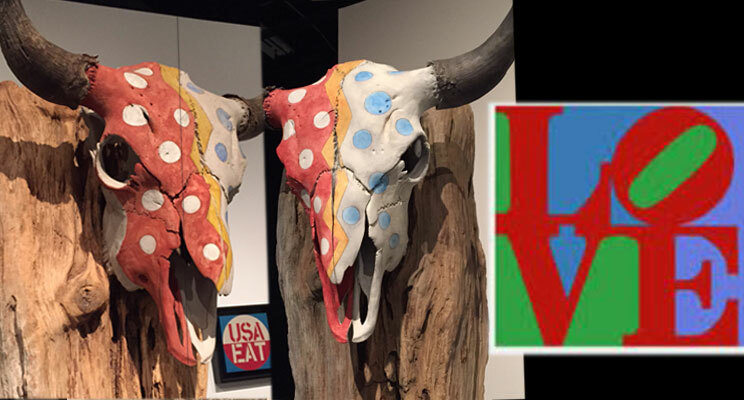 An exhibit of works by Robert Indiana has left me thinking about originality. What’s original? What’s not? Indiana is best-known for his iconic LOVE sculpture and graphic design, which was featured on a US postage stamp. The exhibit I visited in the Tampa Museum of Art featured his 3-D assemblages, largely wood plus found metal and machine parts. It’s part of his body of work I had not experienced before. Throughout the exhibit, there were “identical”sculptures side-by-side. (Like the steer skulls shown above, which were full size and mounted atop a large wooden tree-like column.) The teaching materials explained that he created cast bronze duplicates of some of his sculptural assemblages then painted them to match the original. Seeing the two side-by-side was fascinating. Technically fascinating. Artistically intriguing. The whole idea of a cast bronze is the opportunity to have more than one of a work created. But, I generally think of sculpture of that type as something created for the purpose of being replicated, created originally as clay or stone and then molded and cast in hot metal. Indiana’s replicated assemblages were far more complex. Artists who create two-dimensional work for sale, I believe, struggle with decisions about creating reproductions. Of course, it’s just flat-out unethical to pass off a reproduction (generally a digital print) as an original work. But, if the artist clearly marks the reproduction as such, and the collector knows what he is purchasing, all OK? I surely can’t fault any artist who creates reproductions as a way to mix price points and to create a sellable range of artwork. Artists have to make a living. But, I do think every artist has to think the issue through. Cranking out too many reproductions can diminish the value of the original image. One of the things I enjoy about creating my textile collaged works and art quilts is that I do not feel tempted to reproduce them as giclees. A flat canvas, even one reproduced well, would be clearly completely different from the original. Seeing the layers, textures and stitches is part of the experience. So, I only create and only sell one-of-a-kind-works. My struggles and decisions about originality are more internal. Am I creating a work that is authentic? Am I expressing thought or emotional content that is born from my own unique life experience? Those are the things that reproduction technology can’t duplicate. It’s what makes art: art. Here’s a detail of “Sometimes You Can’t See In,” a collaged art quilt from 2018. It incorporates my own photos hand-transferred to fabric: a kind of reproduction. My hope is that I have incorporated them into a work that is unique and personally expressive. I hope you’ll become a Studio Insider. You’ll hear from me by e-mail every two to three weeks.